Handmade 2012 Olympic bear by Merrythought. 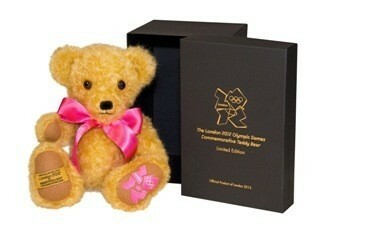 This special teddy bear has been lovingly handmade by Merrythought to commemorate the London 2012 Olympic Games. He is based on a design from 1948 - the year London last hosted the games - and is made from the finest gold mohair. His expresive eyes, hand-embroidered nose and fully moveable joints give him a unique character, complimented by a lucious satin ribbon and beautiful bespoke presentation box. Limited edition of 2012 pieces of each colour bear have been made. Merrythought was established in 1930 and is one of the oldest and most prestigious of Englands toy manufacturers. Merrythought is the last remaining British teddy bear manufacturer and amazingly to this day it's bears are still being made in the company's original Victorian factory in the World Heritage Site of Ironbridge, Shropshire.